Also called "tornado" crimps, these are really handy. 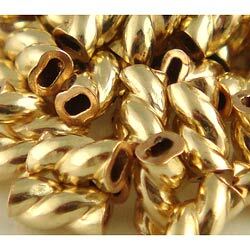 Pretty gold-filled findings that are easy to crimp, with no fussing or needing to use a crimp cover. I highly recommend them! Kits & Gifts>Design Center>Bracelet Designs>Orange You Glad its Halloween?